During August–September 2007, a salvage excavation was conducted in the Newe Rabin neighborhood of Or Yehuda (Permit No. A-5224; map ref. 18775/65923; Fig. 1), prior to the paving of Highway 110. 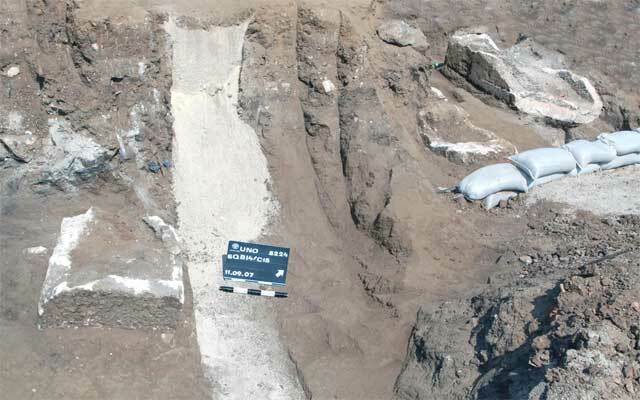 The excavation, undertaken on behalf of the Israel Antiquities Authority and underwritten by Yahel Engineers Ltd., was directed by O. Sion, with the assistance of Y. Rapuano and M. Cho (area supervision), R. Mishayev and T. Meltsen (surveying), T. Sagiv (field photography), E. Belashov (drafting), L. Kupershmidt (metallurgical laboratory), C. Amit (studio photography), Y. Rapuano (ceramics), I. Lidski (pottery drawing) and R. Kool (numismatics). 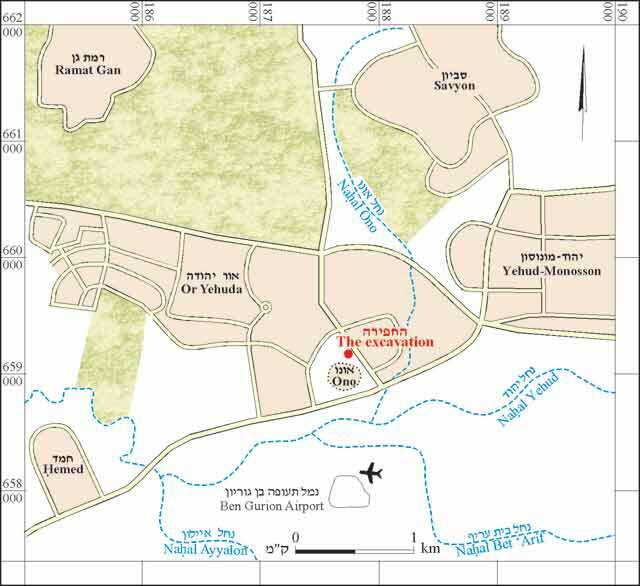 The site is located in the Lod Valley, at the foot of a broad hamra hill, along the northeastern fringes of Kafr 'Ana and c. 0.7 km southwest of the Kafr Junah site, which had been identified with ancient Ono (TAU Salvage Excavation Reports 4). The site and its surroundings had been extensively surveyed and settlement remains from the Chalcolithic and Roman–Byzantine periods, as well as tombs from the Byzantine–Early Islamic and Mamluk periods were excavated (HA 3:14–15 [Hebrew]; HA-ESI 114:114*; HA-ESI 116; Permit No. A-4880). 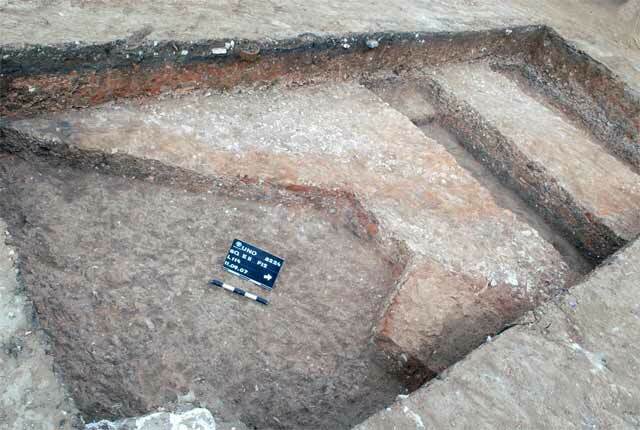 Following the discovery of ancient remains in probe trenches (A–D), an excavation area of twenty squares was opened (Figs. 2, 3). The ancient remains included potsherd debris that consisted mostly of Gaza-type jars from the end of the Byzantine period; fired mud bricks that were probably debris from a pottery kiln, which was not discovered; three stone sarcophagi that dated to the third–fifth centuries CE and parts of buildings on the surface that dated to the late Ottoman period. 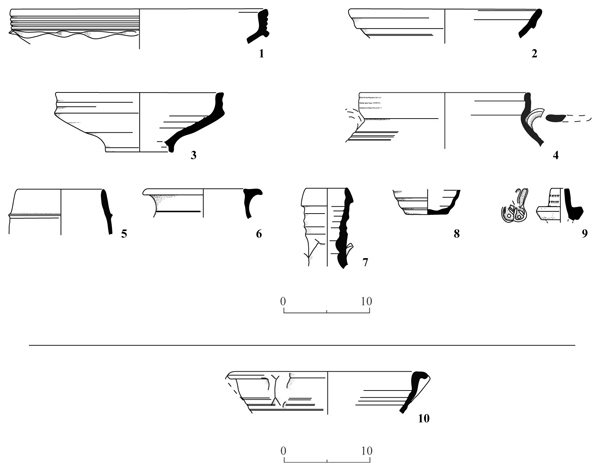 Potsherd debris was exposed over an extensive area (at least 21×70 m, thickness 0.2–1.0 m), mostly in Squares E11, E12 (Fig. 3: Section 3-3; Fig. 4), D12, F12 (Fig. 3: Section 4-4) and F13 (Fig. 3: Section 1-1). 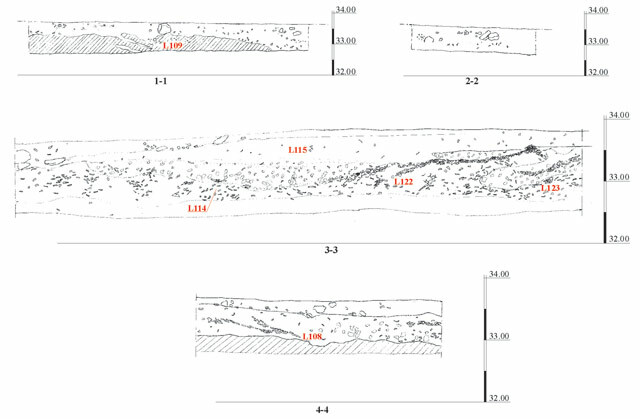 The edge of the heap was visible in the northern part of Trench A and in Square E13; hardly any potsherds were found in the eastern section (Fig. 3: Section 2-2), while the heap diminished toward the east in the northern section (Fig. 3: Section 1-1; Fig. 5). No potsherd debris was found in Squares D14, E14, D16 and F16 and it seems that the middle of the heap was located to their west and north. It was not possible to determine the dimensions of the heap, yet its radius is assumed to have been in excess of 15 m.
The pottery fragments included a bowl (Fig. 6:1), many jars, among them Gaza jars (Fig. 6:2–7) and bag-shaped jars (Fig. 6:8–10), many of which were visibly distorted, a jug (Fig. 6:11) and a lid (Fig. 6:12), all dating to the Byzantine period (fifth–seventh centuries CE). 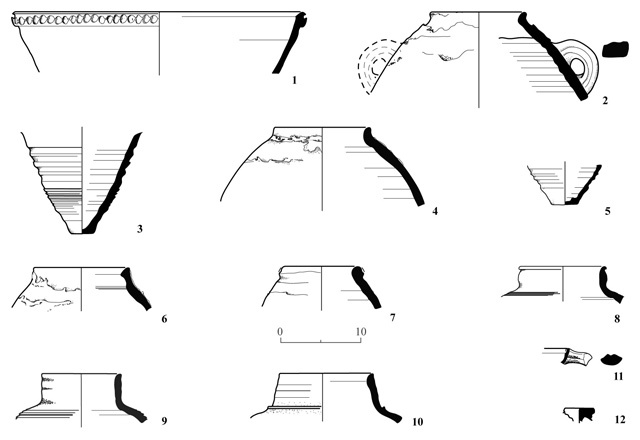 Fragments of burnt mud bricks and kiln waste (Fig. 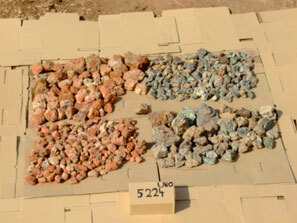 7) and two Byzantine minima (below) were also found. Such piles of debris were formed around pottery kilns, as a result of wasters’ production in the manufacturing process; therefore, the potsherd debris points to a pottery industry that existed at the site. The tapering of the heap off toward the east shows that the kilns were probably located west of the highway. Due to the predominantly western winds that blow in the area, the location of the industrial region was to the east and north of the settlement’s center, thus avoiding the pollution that accompanied the firing of pottery vessels. The production of pottery vessels in this place should be viewed as part of a large industry that existed on the southern coastal plain, particularly in the Byzantine period (ESI 13:106–107). East of the main highway route, in Squares C14, C15 and D15, three plain sarcophagi of soft limestone, plundered in the past and partly preserved (1 – min. length 2.03 m, width 0.82 m, min. height 0.85 m; 2 – min. length 1.68 m, width 0.82 m, min. height 0.45 m; 3 – min. length 1.1 m, width 0.82 m, min. height 0.65 m; wall thickness 0.10–0.15 m; Figs. 2, 8), were exposed. Similar sarcophagi were common to the end of the Roman and the first half of the Byzantine periods (third–fifth centuries CE). The sarcophagi indicate that the initial activity in the area occurred in the Late Roman period or the first part of the Byzantine period, when the site served for burial. Using the edge of towns, close to industrial regions, as a mortuary ground was a common practice in the country at that time. Two walls that formed a corner (W1 – length 1.5 m, width 0.4 m; W2 – length 3.2 m, min. width 0.3 m; Fig. 2) were exposed above the potsherd heap in Square H11. The walls, preserved a single course high (max. height 0.45 m), were built of two rows of stones. The exterior face of the walls was built of large carelessly dressed limestone and the interior face consisted of small stones and light gray mortar. Most of the pottery in and around the building remains (L117–L120) dated to the Late Ottoman period and included bowls (Fig. 9:1–3), a cooking pot (Fig. 9:4), jars (Fig. 9:5, 6), jugs (Fig. 9:7, 8), a pipe (Fig. 9:9), as well as a jar that dated to the Byzantine period. Two coins were found: one is an Abbasid coin and the other, a Crusader one (below), probably evidence of some transient activity as no other remains from these periods were discovered. A partly preserved floor (L129; Fig. 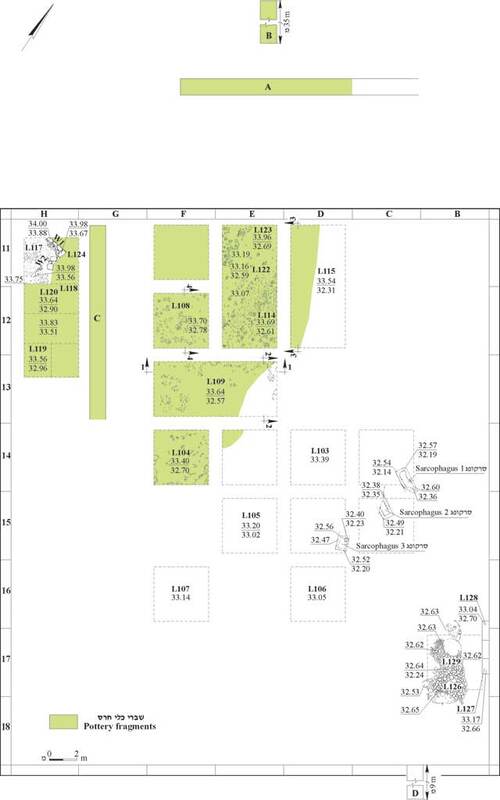 10) that consisted of various size limestone slabs (0.1×0.1–0.4×0.4 m) was exposed in Square B17. 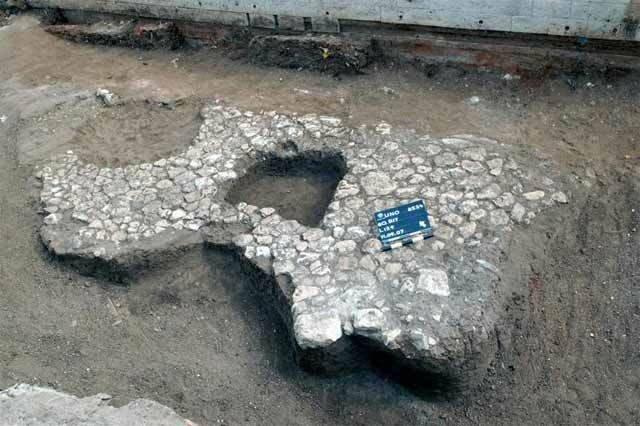 The floor formed a straight line in the east, possibly evidence of a wall that abutted it. A circular niche in the north side may be an installation. A fragment of a basin that dated to the Ottoman period (Fig. 9:10) was found at the edge of the floor. 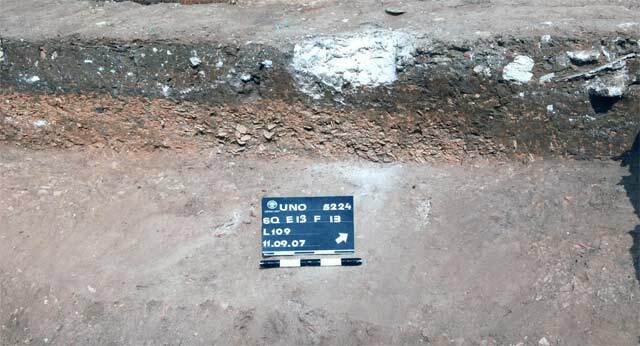 Similar floors were uncovered in the excavations of the Ottoman buildings in Kafr ‘Ana. The building remains from the end of the Ottoman period are evidently those of the deserted Kafr 'Ana village and were probably situated at the farthest fringes of the settlement. Four coins, all identifiable, were discovered. Two Byzantine minima were found; one from the fourth–fifth centuries CE (L122; IAA 119147) is the earliest coin of the four, and the other from the fifth–seventh centuries CE (L113; IAA 119148). 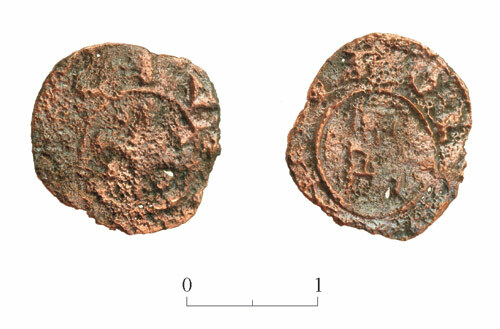 Two copper coins from the Middle Ages were exposed in the vicinity of the building remains (L120), where most of the pottery vessels dated to the end of the Ottoman period. One coin is an Abbasid fals from the ninth century CE (IAA.119146) and the other is a Crusader denier (IAA 119145; Fig. 11) from the Principality of Tripoli, which is the latest coin of the four, dating to the years 1230–1235 CE, when that territory was turned over to the rulers of the Principality of Antioch, located to the north. The coin, which shows a gate with double doors and crenellations and the inscription CIVITAS TRIPOLI (“the City of Tripoli”) around it, appears as part of money used on a daily basis at Crusader sites in the Crusader Kingdom of Jerusalem in the thirteenth century CE. 4. Squares E13 and F13, potsherd heap, looking west. 5. Squares E13 and F13, potsherd heap, looking northwest. 6. Pottery from the Byzantine period. 7. Kiln waste (photography O. Sion). 8. Sarcophagi 1, 2, looking northwest. 9. Pottery from the Ottoman period. 10. Floor 129, looking northeast.